Sometimes we all just need a little cake! Why not make it the BEST Old-Fashioned Peanut Butter Cake ever! So easy and delicious with a super-simple Peanut Butter Frosting! My name is Laura, and I have a problem – a Peanut Butter Tooth. I admit it. I love ADORE peanut butter. Although I have a Sweet Tooth as well, if given the choice, Peanut Butter just might win. But I (mostly) embrace my peanut butter weakness. Even as I tell myself I’m virtuous by using the “all-natural” varieties, I’m aware it’s not really virtue. To me, they just taste better – pure roasted and salted peanut flavor. Just to digress a bit from this cake – I can’t tell you how glad I am that those days where we were afraid to consume fats (like peanut butter!) are over. If you don’t remember, I think it was the mid-‘90s. Those were the days that everyone in the office counted the number of grams of fat they had consumed daily, and spent their late afternoon munching copious amounts of Red Vines and Gummy Bears (!?) because they were fat-free. I had a friend who bragged she hadn’t had more than 2g fat per day in over a month. 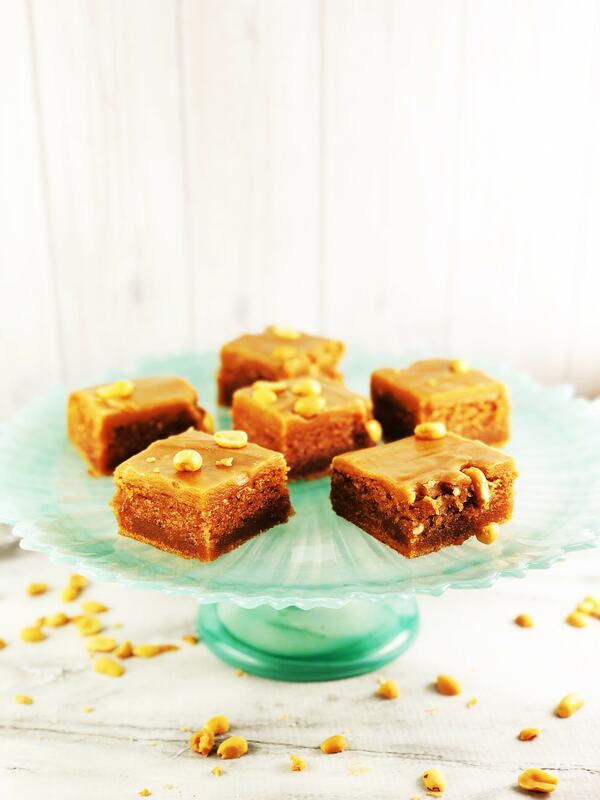 I’ve made (and posted) many Peanut Butter recipes, so my love for the stuff is pretty obvious. 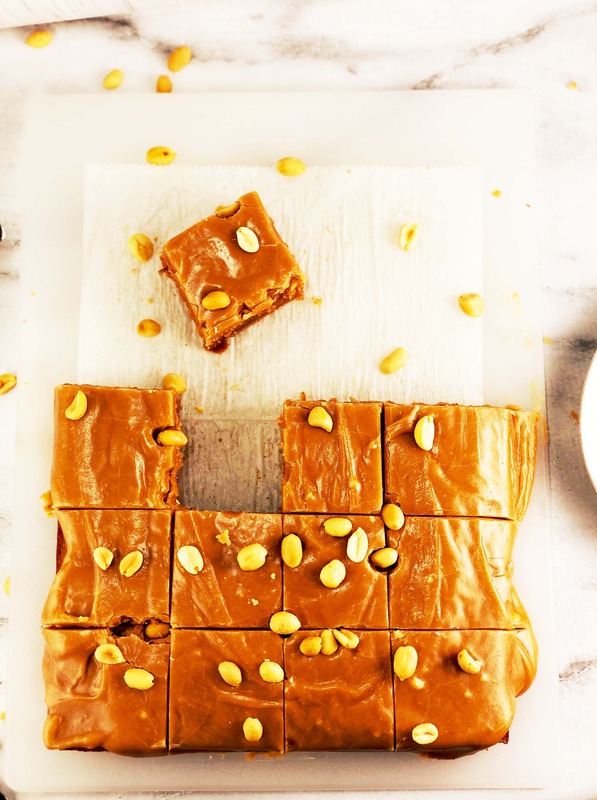 I love this awesome Peanut Butter Pie, and this crazy-addictive Peanut Butter Fudge. But this recipe, from The View From Great Island, might just give those two a run for their money. 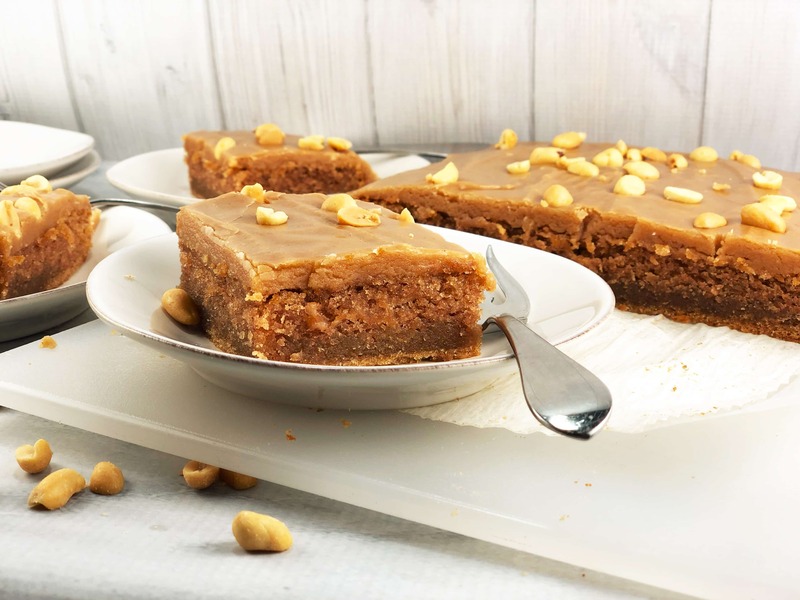 A magnificently moist, soft and tender, and nicely peanut-buttery cake, topped with a super-easy, made in a saucepan WARM! Peanut butter frosting and some roasted peanuts, is AMAZING! Not too sweet, just the way I like! But let me get back to that FROSTING! Much like my favorite frosting ever, the caramelly classic Penuche Frosting, (just like my Mom used to make!) this Peanut Butter Frosting is made in a saucepan, and while it’s warm, poured over the cake. I mean, does it get any better? I think not. So when your Peanut Butter tooth strikes, this Peanut Butter Cake is the solution! I promise. This cake is a Peanut Butter Lover’s Heaven! 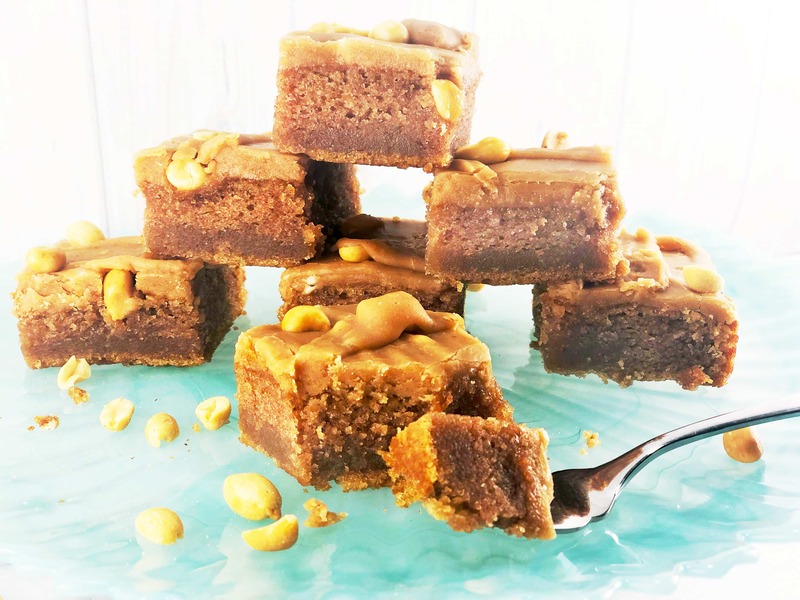 Moist and tender Peanut Butter Cake, smothered in warm peanut butter frosting and topped with roasted peanuts! So.Dang.Delish! From The View From Great Island, this cake is bound to become a favorite in your house – so easy to make, no need to get out even a hand-mixer, just stir and bake! Not to mention the intense Peanutty Flavor! The peanut butter cake of your dreams! I adapted the recipe by using all-natural peanut butter, just peanuts and salt. If you decide to use all-natural, just be sure it is stirred together as well as you can so it doesn’t separate during the bake. Just bake it in a 13×9, cook the frosting and pour that magical stuff over the cake! Serve warm, at room temperature, or cold – all super yummy! If there are any leftovers, they keep nicely in the fridge (well-wrapped) for several days, at least. Preheat oven to 350F (or 325 F for Convection). Spray a 9×13 pan. In a small saucepan, heat the butter and water. When it comes to a boil, take it off the heat and whisk in the peanut butter and oil until smooth. It should be pretty thin. Let the pan cool several minutes and whisk in the eggs, buttermilk and vanilla until well-blended. Pour the wet ingredients into the dry ingredients, and whisk until just combined. Pour the batter into the prepared 9×13 and bake 40-45 mins (mine took 40 mins), until a toothpick inserted into the center comes out clean. Set the cake over a cooling rack while you prepare the frosting. In a saucepan, heat the butter, peanut butter and buttermilk and bring to a full boil. Remove the pan from the heat. Beat in the vanilla and confectioner’s sugar (a cup at a time). Beat until smooth following each cup of sugar. It’s nice to reheat the whole batch a bit before pouring over the cake, because the frosting sets up on the cake pretty quickly. Add extra buttermilk a Tablespoon at a time if it becomes too stiff to pour. Pour the hot frosting over the warm cake and spread evenly. Hi, Dawn! I agree, when I see “fat-free” anymore, I think, “im just going to be hungry if I eat that.” Weird how times change as we learn more, right? The texture on this cake looks amazing!! I’m not sure I could stop with just one slice 🙂 Pinning!! This cake looks totally mouthwatering! Hey Marissa! Yes, that sounds like my kind of group and totally my idea of “support”. I’m all in! Thanks so much for your visit and your great idea! We’re all peanut butter fans at our house Laura! This would be a total hit.Looks so moist and delicious! Thanks, Mary Ann! Glad you have a family of Peanut Butter Tooths (Teeth? Ha, doesn’t sound right, does it?). Hope you get a chance to make this scrumptious cake! I appreciate your visit! Wait…a warm peanut butter frosting? Now that needs to make an appearance in my kitchen! This cake sounds absolutely delicious, Laura! Like you, I love peanut butter. I’ll take it however I can get it…although I must admit that cake form is a winner. 🙂 And, yes, that’s silly about the whole no-fat thing. All of these fad diets get their hype from cutting out something. Carbs. Sugar. Fat. We live by the philosophy that everything is ok in moderation. Just balance it out! And if you get out of balance? Well then do an extra workout or two. Either way, I need a slice of this cake ASAP! It looks delicious, my friend. Thanks so much, David! I’m totally on the same page as you with the moderation thing. If we keep that philosophy, it’s easier to get back on track with the extra workouts, etc. when needed. I hope you get the chance to try this cake, it is truly a new favorite in my house! These do look good but I have to say, that frosting looks particularly delicious!! Thanks, Caroline! Hope you get the chance to make this cake – it’s so worth it, especially as it’s so easy! Thanks for visiting! I can just see your lot setting down for the Superbowl event today, halftime comes the chips and dips come out and then your old fashion peanut-butter cake comes out. Touchdown!!!! That’s about it, Ron! We were wishing our Seahawks could’ve been in the SuperBowl, but the fact they didn’t makes this cake the highlight of the game, for sure! I may need to bake another cake midway through though, it’s in such high demand around here! Thanks for your visit! Since I don’t count calories, this one is on my list, definitely ! Enjoy the week end dear ! Thanks so much! And I hope you get the chance to make this cake – it’s a keeper, for sure! Thank you for your visit!? I vividly remember the days when we weren’t supposed to eat fat. I rebelled and ate it anyway :). I love peanut butter too, and I’d love a slice of this gorgeous cake today! Thanks so much Kelsie – I’m sure you’re as glad as I am those days are gone, even though you didn’t subscribe. Thanks for your visit! Oh Laura, can we get a hallelujah for no more low-fat things!?!? I’m so glad we can rejoice over all of the good fats! I LOVE peanut butter so much, so a peanut butter cake is pretty much the best thing ever. Love! I agree with everything you said, Katherine! RN this cake is definitely the best thing ever in my house! I’m pretty sure I’ll be making it again soon! Thanks for visiting!? Absolutely delicious Laura! Lynne and I are huge fans of peanut butter, and a peanut butter cake is just heaven! If I was to make this I would need to make it with a jar of Reeces smooth peanut butter as that’s my favourite. I don’t keep it in the house or I’d eat spoonfulls of it daily. But I could make an excuse that I have to buy it to make this cake. Ha ha! Thanks, Neil! I haven’t tried the Reese’s PB, strangely enough. Going to have to give it a try! I think any excuse to make this cake (or buy peanut butter) is justified, for sure! Hope you get the chance to make this wonderful cake, and thank you so much for visiting! After seeing this, I definitely need some cake right now! It looks so moist and yummy! Craving! Hi, Kelly! It is a totally crave-able cake. I’m actually craving it right now, too! We’ll see if it’s enough to make another one, because naturally, the cake lasted all of 2 days in my house. 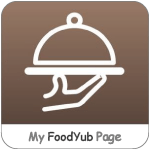 I imagine i’ll succumb to this craving – totally worth it! Thanks for your visit!